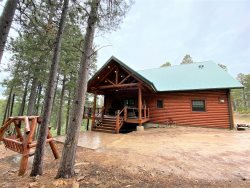 This great private rental home is available for Sturgis Rally week. It has 4 bedrooms, 2.5 bathrooms, central air conditioning, large deck, 40×40 3 stall garage and no gravel. It sleeps 9 with 4 queen beds and 1 twin. Located in Sturgis, this home is close to Main Street and Interstate 90. Check out the view of Bear Butte from this deck!